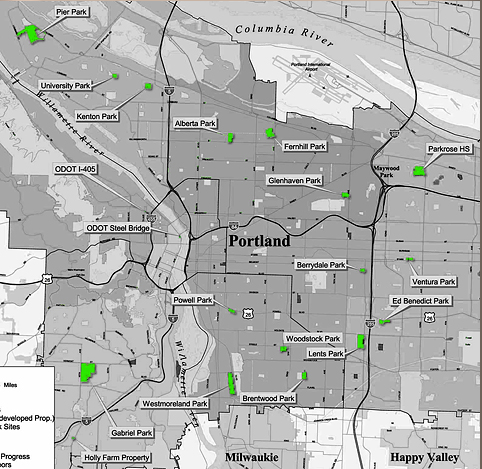 SPS is a non-profit that seeks to provide and help facilitate the creation, protection and maintenance of public skateparks within the city of Portland. Choosing to work with this organization was based on an understanding of a value of these places and how positive of an impact they can make on both a community they are within and an individual. A 19 skatepark plan was developed in 2005, this plan included 3 types of skateparks – 19 in total – 13 neighborhood skate spots, 5 district-wide skateparks, and one central city anchor park. Several of these skateparks have already come to fruition but there have been unfavorable delays at points. One of the original parks on the plan that we are still working towards, SPS has approximately 50% off the funds needed, this park initially was intended to serve as a nod to Brooklyn Street, a now defunct DIY skatepark in South-East Portland that was in close proximity to Powell park. The majority of the money for this project has been crowd funded via events and online platforms. SPS is also working to bring other skateparks out of the 19 park plan and into reality, events have been held for projects such as the Steel Bridge Park. Very initial stages of working on ideas of skate dots have also been something that is started to be looked and the implications and interest of bringing more of these small spots to Portland.